Greg Osgood is working to integrate visual, fluoroscopic and CT data all in one image. "I am passionate about making pelvic surgery easier for the surgeon,” says Greg Osgood, chief of orthopaedic trauma in the Johns Hopkins Department of Orthopaedic Surgery. 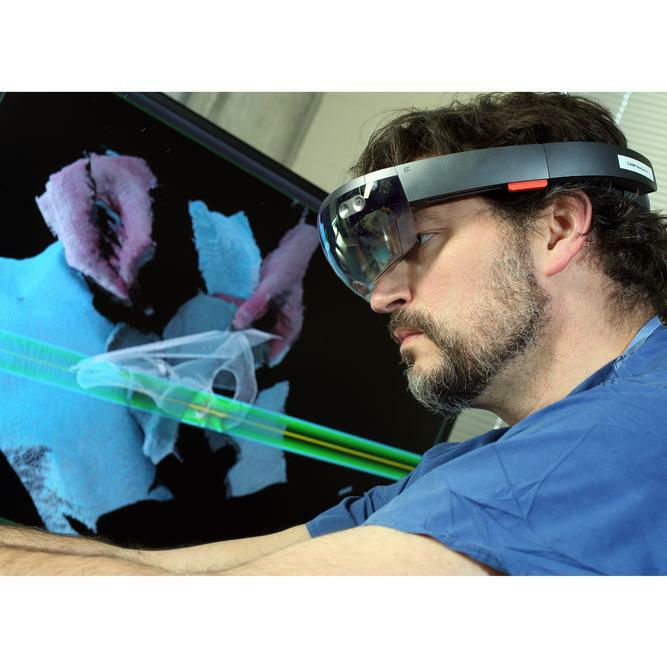 Osgood believes that head-mounted displays using three-dimensional imaging data can help surgeons improve imaging and operative techniques, minimize incisions and reduce the complexity of surgery. “Making the procedure more technology-based helps us provide patients with the same or better outcomes, but in an easier surgical manner,” says Osgood. A recent study using this technology in a simulation of percutaneous pelvic surgery showed shorter operative times and less radiation use compared with traditional methods. Osgood is combining data from advanced imaging techniques, such as ultrasound, computed tomography (CT) and MRI, with traditionally used operative fluoroscopic images, creating virtual three-dimensional imaging and “maps” that can be overlaid onto the patient’s body during surgery. “We have been working on a project for several years to integrate visual, fluoroscopic and CT data all in one image with what we call a Cam-C. It is a C-arm fluoroscopy unit with a camera mounted on it for augmented reality imaging,” says Osgood. Augmented reality imaging uses virtual images in the surgical field to give more information than the visual image provides. Using this device, the surgeon can easily process the information and perform the surgery in a safer manner with fewer radiographs. Osgood is collaborating with two Johns Hopkins researchers at the Malone Center for Engineering in Healthcare: Jeff Siewerdsen, professor of biomedical engineering and director of the Carnegie Center for Surgical Innovation, and Nassir Navab, professor of computing and director of the Computer Aided Medical Procedures Lab. Siewerdsen is working to improve C-arm CT and image registration methods to make image quality better and reduce radiation dose during surgery. Navab is working closely with clinical and industrial partners to enhance three-dimensional imaging and augmented-reality technology. His team has introduced camera-augmented mobile C-arm technology and is now focusing on the integration of head-mounted display technology into the clinical workflow. Osgood believes the greatest potential of these new technologies lies in their teaching capabilities. During surgical simulations, residents who have never been trained in pelvic surgery were able to perform complex techniques with accuracy, using very few radiographs.